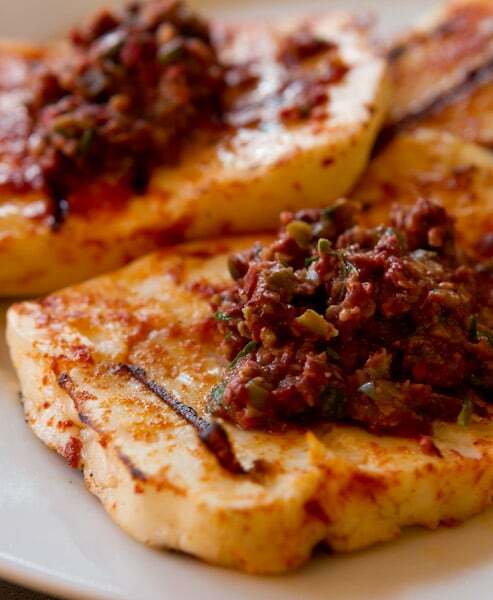 Did you know that olive tapenade recipes are not always vegetarian? My formerly vegan self was not aware of this fact, and I was about a year into my veg adventure before someone informed me that one of my favorite spreads was indeed not inline with my dietary requirements. Not a terribly squeamish vegan, I simply shrugged off the fact that I’d been eating anchovies, sardines, or similar small, fatty fish — which would explain the not-so-lovely-tapenade breath — but I did decide to avoid it for the duration of my time on Planet Veg. Now that I’m eating meat again (and have been for quite some time), I’ve paradoxically started making my homemade tapenade sans-pesce. I’m not sure why. Maybe it’s the fact that my dad used to eat sardines straight out of the can, which grossed my five-year-old self, or maybe I just prefer the savory notes of the olives over the umami of the fish. Either way, I love this recipe and I think you will too. This vegetarian olive tapenade recipe is rich and flavorful, minus the sardines. I've added piquillo peppers which add color and a touch of tart-sweetness. Add all ingredients to small food processor. Pulse until the tapenade is finely chopped. Pop open the lid of the food processor and taste. Does it need more acid? Add another teaspoon on lemon juice. Does it need more heat? Add a few more turns of the pepper grinder. Does it need a bit more fresh, “green” notes? Add another tablespoon of parsley leaves. Pulse again and store in an airtight container in the refrigerator for up to a week. A very smart reader mentioned adding a little miso paste to the tapenade to add a savory note that would usually be provided by anchovies. I thought I'd mention it here, for those that want to try it!